FRAMINGHAM, Mass.--(BUSINESS WIRE)--Jul. 8, 2016-- Staples, Inc. (NASDAQ: SPLS) announced today the expansion of Erin Condren’s line of stylish organization products to Staples.com and more retail locations. Customers looking for the latest in bold and inspiring organization solutions can now find Erin Condren’s line of products (www.staples.com/erincondren) for the first time on Staples.com and at nearly 500 Staples stores across the country. In addition to the Erin Condren desk sets, teacher planners, and notebooks that are now available to Staples customers, the expansion of products also includes exclusive-to-Staples Erin Condren 18-month LifePlanners™ that reflect her signature style of bold, trendsetting color patterns and inspirational messages. 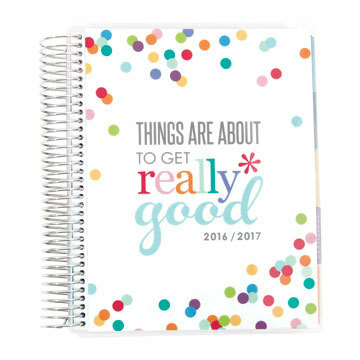 LifePlanners and planner accessories: In exclusive-to-Staples patterns and colors, Erin Condren’s LifePlanner includes daily, weekly, and monthly views and can be customized with a number of accessories. Teacher’s Lesson Planner: Brings color and organization to the classroom, with 40 weeks of lesson planning, 12 monthly double-page calendar spreads, double-page checklists, reusable sheet protector, plan for it pouch, keep it together folder and dry erase board inside covers. Carry-all clutches: Bold colors and inspirational quotes printed on stretchy neoprene cases make it the perfect bag for the LifePlanner, tablet, cell phone and accessories. Erin Condren’s collection of LifePlanners, planner accessories, notebooks, teacher planners, markers, carry all-clutches, desk sets, pads and memos retail from $2.99-$64.99. To shop Erin Condren’s organization solutions, visit the Staples store locator or shop Staples.com (www.staples.com/erincondren). After finding herself a stay-at- home mom to twins, balancing cabin fever and a fluctuating sleep schedule, Erin Condren began designing and printing custom note cards from her home office to give as gifts for family and friends. With the launch of an official website in 2005, www.erincondren.com, her products spread like wildfire. Since then, it has evolved from just note cards and stickers to LifePlanners™, TakeNote™ notebooks, accessories and so much more. All items ship from two state-of-the-art printing facilities in Los Angeles and Austin. With features on “The Today Show,” “Ellen,” “E! News” and countless magazines and celebrity endorsements, Erin Condren’s paper business aims to make every day stylized, organized and personalized.